Islandia, NY - October 28th, 2013 - Suffolk County Crime Stoppers and Suffolk County Police Fourth Precinct Crime Section officers are seeking the public’s help to identify and locate the man who stole various items from the electronics department in the Walmart store in Islandia. 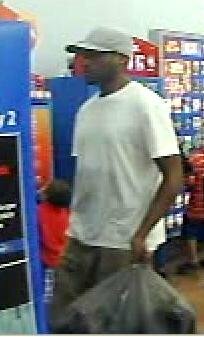 A man entered the Walmart store, located at 1850 Veterans Memorial Highway,on July 19 at 6:30 p.m., and again on July 25 at 9:40 p.m. and stole a number of PlayStation 3 and Xbox 360 wireless controllers, along with other miscellaneous electronic items. The suspect was seen cutting open the packaging and removing the merchandise. He then exited the store without paying for the merchandise. The suspect is described as a black male with a medium build. He was wearing a white t-shirt, tan shorts and a grey baseball hat. Suffolk County Crime Stoppers offers a cash reward of up to$5,000 for information that leads to an arrest. Anyone with information about this crime is asked to call anonymously to Crime Stoppers at 1-800-220-TIPS. All calls will be kept confidential. Subject: LongIsland.com - Your Name sent you Article details of "SCPD Crime Alert: Man Wanted for Petit Larceny in Islandia"